Here are some very short and sweet definitions to help understand some of the diet terms used these days. Our Sweet Vegan Gift Basket. The difference is Vegetarians don’t eat meat, fish, or any animal. Vegans go a bit further and eat no animal products such as eggs, dairy or honey. Our Gluten Free For All Gift Basket. Gluten is a mixture of proteins that occur naturally in wheat, rye, barley and crossbreeds of these grains. The FDA defines gluten free as having a gluten limit of less than 20 parts per million of gluten in foods carrying that label. 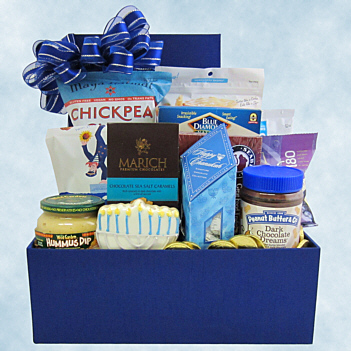 We are careful with the products we put in our gluten free gift baskets. Luckily there is a world of good food to use: Nuts, Cheese, Fruit, Tea and Coffee, Chocolates, Chips and so much more. Our Happy Chanukah Gift Basket. Kosher is an adaptation of the Hebrew word meaning “fit” or “proper.” Kosher foods are those that conform to the regulations of kashrut. These will carry the symbol of the rabbinical council that approved the item. Fruit is naturally kosher. The best known rules are: no pork, no mixing of dairy and meat, and the term pareve which means it is a neutral food that can be eaten with meat or dairy. This is a very short abridged definition. There is much more to be found in research and among those who keep kosher (many who have been very helpful with advice). We have an array of kosher products in our shop including wine, cheese, chocolates, cookies and more. We also carry Kosher for Passover during that holiday. You can call and check the symbols on the foods we have if you have any questions. Note: These definitions above are by no means complete as each diet has complexities that we don’t have the space to go into here; and it varies by individual. For more data please research or ask the people you know who adhere to one of these diets to find out how they adapt it for themselves.